Scientist,scholar and author, Paul LaViolette presents astronomical and geological evidence of the occurrence of a global conflagration, catastrophic deluge, and mass extinction at the end of the last ice age. He links this with ancient records, revealing that an advanced antediluvian culture had met with an untimely demise. He shows that this climate altering event was triggered by intense cosmic ray winds arriving from the galactic centre. 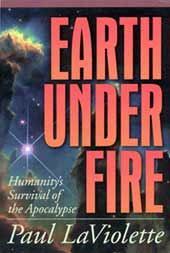 He explains how the ancients have left us sophisticated messages encoded in myths and lores warning us of this recurring disaster which will arrive again with little warning. Paul Laviolette Response to Cycles of Cosmic Catastrophe by Richard Firestone, Allen West and Simon Warwick Smith.